The concept Volkswagen XL1 (VW 1-Litre) is a two-person limited production diesel-powered plug-in hybrid produced by Volkswagen. 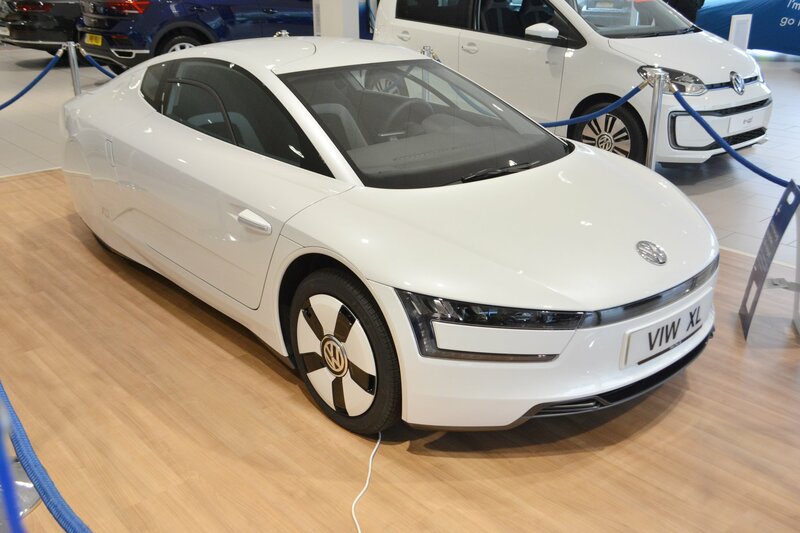 Once the most fuel efficient car in the world returning a staggering 313 miles per gallon, it is powered by a hybrid drive chain combined with an 800 cc TDi diesel engine and is only one of 200 produced by VW. It boasts gullwing opening doors, a super lightweight body and a seven speed gearbox with a modest top speed of 99pmph. Alan Day Volkswagen are the proud sponsors of European rugby champions, Saracens, who have recently been awarded the Freedom of the London Borough of Barnet for their work to help young people with learning disabilities. The prestigious award was granted to the club for their match winning performances on the pitch as well as for their work in the community. The Sarries Foundation, teamed up with sponsors Alan Day Volkswagen, who supply the club with a fleet of vehicles for players and senior staff, and help organise pioneering touch rugby sessions every Monday for youngsters aged between 11-20-years-old. Commenting, on the partnership, Alan Day VW Managing director, Paul Tanner who has showrooms in Hampstead, The City and New Southgate, says: “We are delighted and proud to be associated with Saracens as a main sponsor and supporting this great sporting initiative. The popular touch rugby sessions, which are run by Thomas Gamage won the Premiership Rugby BreakThru Award in a glittering ceremony at the House of Commons. The aim is to improve the participants health, mental wellbeing, to create opportunities in the community and for like-minded parents to meet while the boys are training. First team players like England stars Billy Vunipola, Brad Barritand Jamie George regularly give up their time for free to help coach the youngsters. They are joined by Alan Day VW Managing Director Paul Tanner and members of his staff who sponsor the sessions and provide refreshments for parents watching from the stands. All the kids have a go at the cross bar challenge and the tackle bags and interact with each other in specially arranged games. Fun away matches are also organised against Aviva Premiership opponents who also support teams with disabilities.